Boot Hill Auto can provide general maintenance for your classic car or completely rebuild that project in your driveway to better-then-new condition. Our highly skilled team of automotive professionals know what they are doing and it shows. You can see their work on Boot Hill Auto projects at shows all across the country. If you can't make it out to a show that is featuring some of our work please feel free to stop by the shop for a tour and get a closer look at how Boot Hill Auto makes it happen. The President of Boot Hill Auto is Blaine Schmidt, a 12 year CFL veteran who played for the Edmonton Eskimos, Toronto Argonauts and Hamilton Tiger-Cats. Blaine has been involved in the restoration hobby for over 20+ years. As a successful business owner he realized that there was a need for quality restoration service's offered at one centralized location. 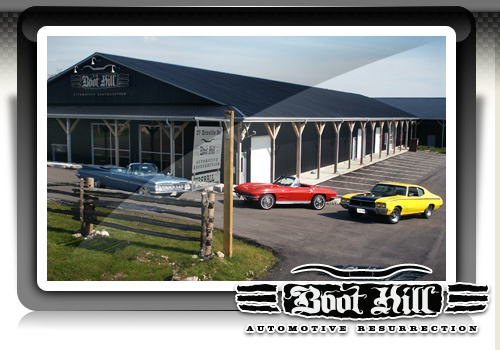 Blaine's vision became reality when he officially opened the doors to Boot Hill Auto in 2009.